Death will be spreading the holiday cheer by claiming more victims on Blu-ray this December. 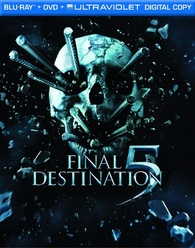 In an early announcement to retailers, Warner Brothers has revealed 'Final Destination 5' will be available on December 27. The R-rated fifth chapter in the horror franchise once again sees group of people try and cheat death when Sam (Nicholas D'Agosto) has a premonition of a bridge collapse that was meant to claim their lives. Tony Todd also returns as the mysterious coroner William Bludworth. Specs have yet to be detailed for the Blu-ray/DVD/Ultraviolet Digital Copy combo pack, but supplements will include: Circle of Death, Alternate Death Scenes, and Visual Effects of Death: Collapsing Bridge & Airplane Crash. You can find the latest specs for 'Final Destination 5' linked from our Blu-ray Release Schedule, where it's indexed under December 27.